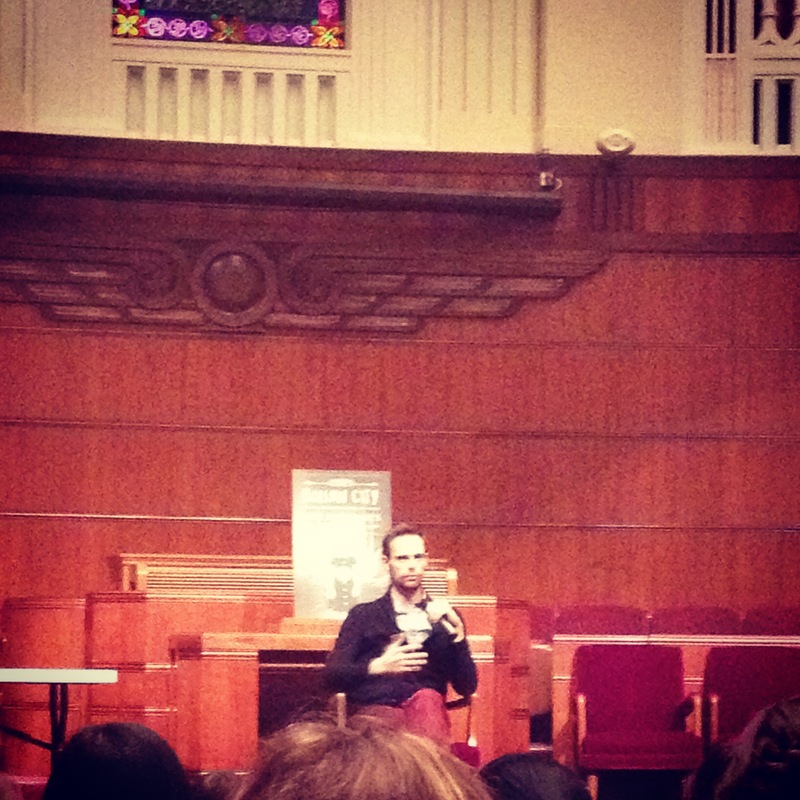 Last week I went to see Ransom Riggs speak at a Rainy Day Books event. Luckily, they moved the event to Unity Temple to accommodate the crowd, which means I only spent $30 on books as opposed to the $100 I generally spend when unleashed in an independent book store that has a well-stocked young adult literature section. I haven’t actually read Miss Peregrine’s Home for Peculiar Children yet, though it’s a book I often recommend. I had great success putting it in the hands of reluctant readers when I was interning at a high school library. “It’s creepy and full of weird photographs” was all I needed to say to entice a student to choose it for a book report. When I first heard of Miss Peregrine’s Home for Peculiar Children, I had one of those “why didn’t I think of that? !” moments. Because writing a creepy book that includes creepy vintage photographs is totally my style. After hearing Ransom Riggs tell the story of his path to publication, I firmly believed that a lot of the success of Miss Peregrine’s Home for Peculiar Children can be attributed to a “right place, right time” coincidence, though his talent certainly helped. Ransom told the story of going to film school after getting a liberal arts degree at Kenyon College, where he met John Green, who got him a gig at Mental Floss. 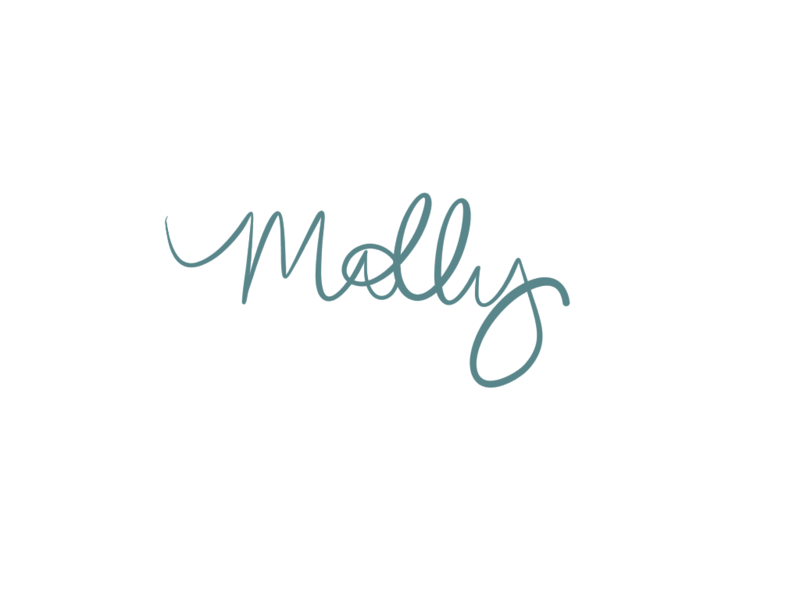 He then started working for Quirk Books, a press that publishes mostly nonfiction but had a hit with Pride & Prejudice & Zombies. His weird, personal interest in collecting crazy old photos of people he didn’t know turned into an idea for a book, and then BOOM. NYT bestseller. It was a fun story to hear. Ransom also talked about benefit of accepting opportunities as they came, even though they weren’t in film, which was his preferred industry. His story was very inspiring. Ransom’s talk also got me thinking about all kinds of things that had been bouncing around my mind this week. I’ve been thinking a lot about photography, which I love, despite having little talent for. I have a nice SLR and DSLR camera, but even though I’ve taken beginning photography classes, I can’t use either camera to its full potential. I’m eligible for an upgrade to a new phone, and the only selling point for me (aside from a new Kate Spade case) is that the iPhone 5 takes better pictures than my iPhone 4S. I even scrapbook. basically, I like taking pictures. But really, what does the act of snapping a photograph mean? I’ve also been thinking about Susan Sontag’s On Photography and how photography can be predatory. Sontag’s comments are very insightful, especially when applied to our current fascination with presentation of self on social media. Even though her writing predates these platforms by decades, her thoughts are particularly insightful and seem even prophetic. Brain Pickings has an article that summarizes Sontag’s work. It does a great job summarizing and contexualizing Sontag’s thoughts on photography as a medium. Who are these people whose images augment and inspire and shape the story of Miss Peregrine’s Home for Peculiar Children? Ransom Riggs doesn’t know, and no one has stepped forth and said, “that’s an image of a person in my family.” Which only adds to the haunting and almost tragic history of such images, in my opinion. But I wasn’t just thinking about photography this week. I’ve also been thinking about the future of storytelling and how our conception of a “book” might change in the future. I’ve been talking with co-workers about ebooks and the publishing industry and how artists can make money and how libraries can make work accessible and all these BIG ISSUES. Ransom Riggs also discussed his love for film as a medium, and how he felt freed by being able to describe a character’s thoughts in a way screenplays don’t allow when he switched to the novel format. When asked about future projects and integrating photographs, he talked about his love for video, which got me thinking about the future of ebooks and how we “read” stories. Riggs seems to have the skill set and market position to really be at the forefront of these changes in the book world, and I’m interested to see if he capitalizes on them. What could a “book” look like? This post from N. V. Binder explores the ebooks vs. print debate in a profound way, that suggests that ebooks which try to replicate the experience of reading a “real” book will fail but those that successfully integrate storytelling media available through the web will flourish. Authors like Ransom Riggs seem to be in a great position to pioneer these type of transmedia stories. Still, there’s always going to be a market for words printed on bound paper. The quality of both these books—both paperback and hardback—are exceptional. In terms of both design and materials, they are worth the full cover price. I’m happy to have a signed edition on my shelves. I love that Rainy Day Books consistently schedules popular writers, including those who write for young adults. Hearing an author speak is fascinating to me as a writer and as a librarian and reader. 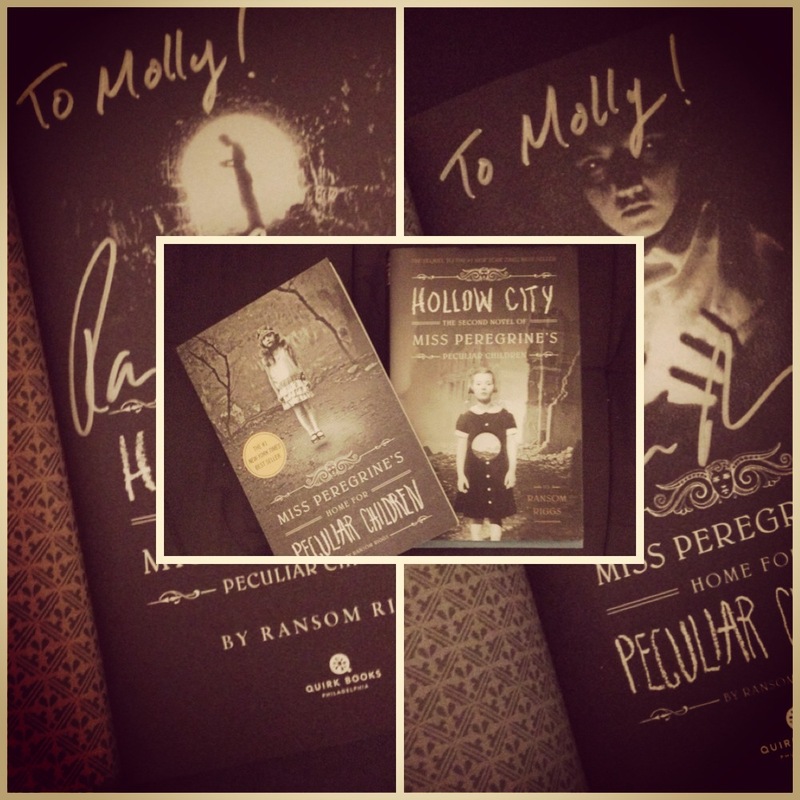 If you have a chance to see Ransom Riggs speak, or to support your own local independent bookshop by attending an author event, I highly recommend taking it! What are your thoughts on Ransom Riggs, Miss Peregrine’s, photography, author events, or the future of publishing? “‘It’s creepy and full of weird photographs’ was all I needed to say to entice a student to choose it for a book report.” This made me laugh! The book certainly sounds interesting.